A little less than thirty years ago, I was still fairly naive about yard landscaping. I was an ace on organic vegetable gardening, and I knew a lot about native plants, but I was mesmerized by all the glossy gardening magazines that demonstrated how we all should be landscaping our yards. I bought the hype. What can I say? Gardening is all about trial and error. Experience is always the best teacher, and my experience with Leyland Cypress (Cupressus x leylandii) is a textbook example of what I’ve learned the hard way. 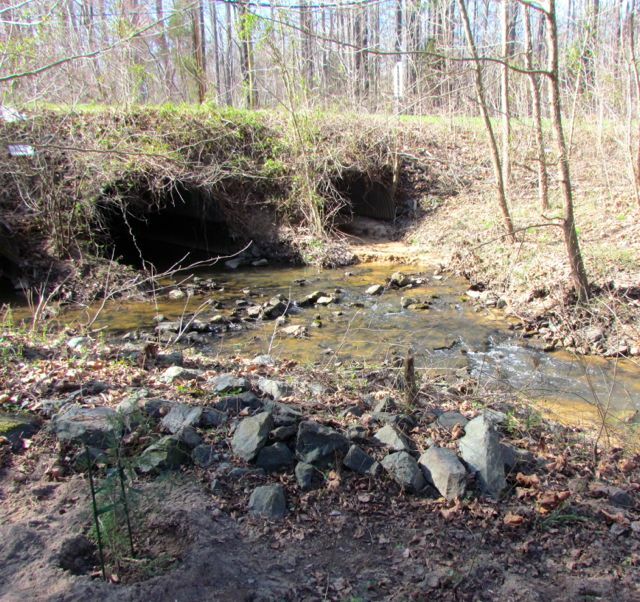 Vehicle noise is especially loud as it echoes in the creek’s drain pipes under the road. When Wonder Spouse and I first moved to our five-acre landscape 26 years ago, we were eager to block out any views of what has become an increasingly busy road. Most of the road front was already blocked by a wild mix of overgrown vegetation dwelling beneath a stand of mature Loblolly Pines, but down in the far northeast corner where the creek that borders our property goes beneath the road, we had an unobstructed view of the traffic, and vice-versa. To reduce traffic noise and increase privacy, we decided to add evergreen trees that would fill in the gap. I immediately thought of Leyland Cypresses. Leylands were the hot new screen tree back then. They grow very fast — over three feet a year, they keep a nice columnar shape. They can grow 60-90 feet tall, but remain 12-15-feet wide. And they were advertised as trouble-free. Now wise landscapers in my region know better. 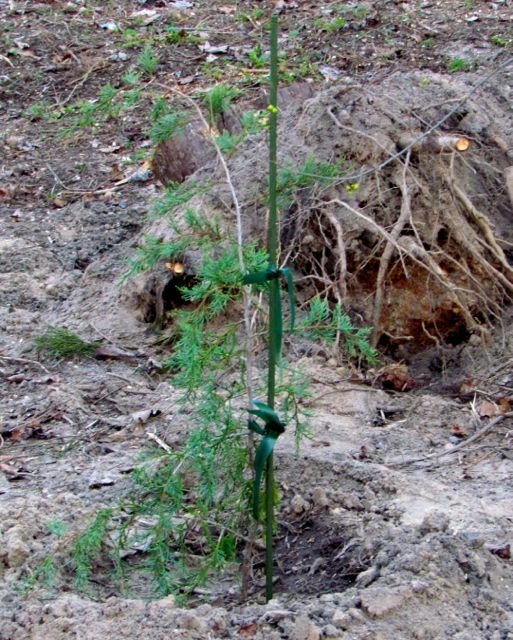 It turns out that this natural hybrid of western North American cypresses is prone to pests and diseases, especially when it’s not sited correctly. We planted our trees in moist, well-drained sandy loam; we never had any significant pest/disease issues. In fact, our Leylands did exactly what we envisioned, growing 50-60 feet tall in 26 years; they blocked the road and its traffic noise perfectly. What was not advertised in the literature a quarter century ago — at least not anywhere I saw — was the fact that Leyland Cypresses have remarkably shallow root systems for trees that grow as tall as they routinely do. This, of course, makes them susceptible to being toppled by high winds and heavy ice and snow accumulations. Because our trees were tucked down by the creek, they were protected from strong winds. And they weathered past ice and snow storms just fine. But the last big storms were about 12-15 years ago. Our Leylands had grown probably another 10-15 feet since those storms. This past February’s 5-inch snow was wet; heavy accumulations of snow stuck to every evergreen in my yard. We’re still cleaning up broken branches of Loblolly Pine and Southern Magnolia. 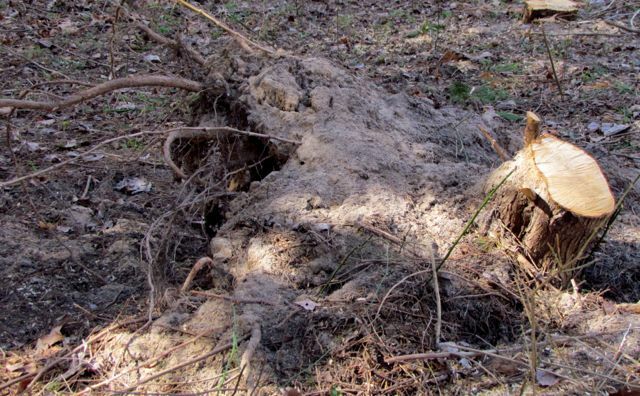 But those trees didn’t topple; a number of the Leylands popped right out of the soil and fell onto each other. Five or six trees — about half the stand — came down. Mount Brushmore after storm clean-up. It took Wonder Spouse and two helpers — all with chainsaws — half a day to clean up what the snow toppled. The rest of the Leylands seem to be holding their own for now, but we are debating whether we should bow to the inevitable and take them down too. However, that’s a task best left to this autumn. Our immediate concern was the gap left behind that has re-opened unobstructed views (and noise) of the road. Note the road behind the tree and the Leyland stumps on the right. Having learned my lesson, I decided to replace the Leylands with native evergreen trees that I knew would thrive in that spot. They don’t grow as quickly as Leylands, being characterized as having moderate growth rates. Both of these native species already grow in my yard. They were here when we moved in. Neither species suffered any damage from the recent heavy snow. I know their roots go deep, having tried to relocate their seedling trees from time to time. Thus I settled on Red Cedar (Juniperus virginiana) and American Holly (Ilex opaca). Both species are important food sources for native wildlife, they provide shelter during winter, and make excellent camouflaged nesting sites in summer. A naturally occurring stand of Red Cedars that grows on the edge of our floodplain. 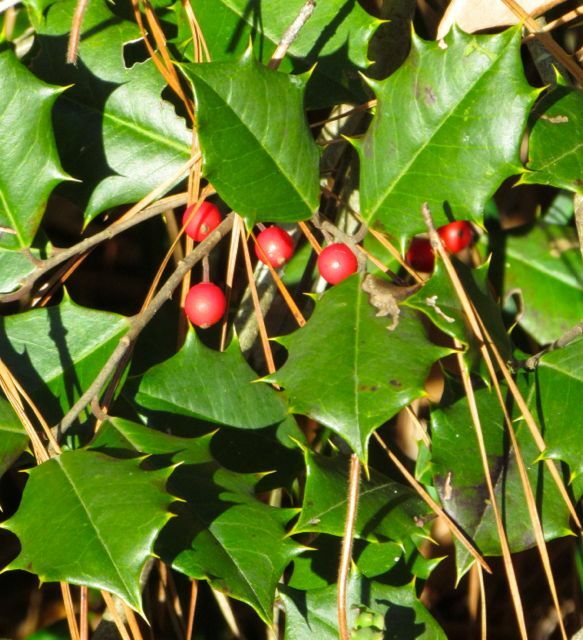 Native hollies provide food and shelter for wildlife. We decided to invest in named varieties of these natives, because they offer more predictability, and often a bit more vigor. We need strong, hardy trees for this spot. Thus, I went to my favorite mail-order nursery that offers small, bare-rooted trees with a price friendly to our budget constraints. I’ve had great success with plants from this nursery. They start out small, but with good siting, they always grow into wonderful specimens in a few years. For our two holly additions, I chose Ilex opaca ‘Dan Fenton.’ Because hollies are either male or female plants, nurseries sort these out and sell mostly females, because they are the ones that produce berries. If you don’t have male hollies growing nearby, you must add at least one to your planting. Our property is loaded with American Hollies of both sexes, so I just got two female plants. They are supposed to have very glossy foliage and look much more ornamental than the average native tree. 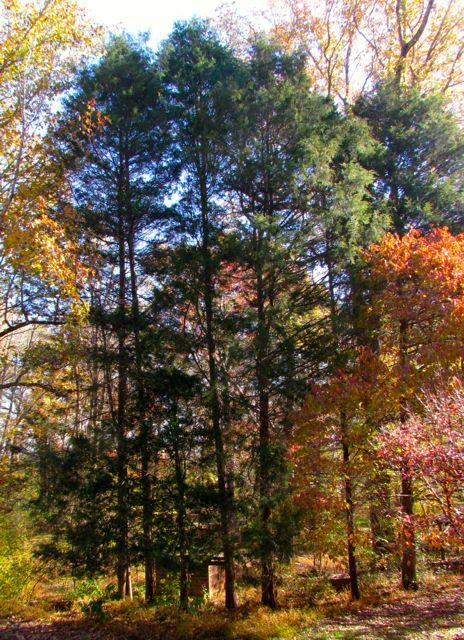 Mature trees are predicted to be 20-25-feet tall and 15-20-feet wide. 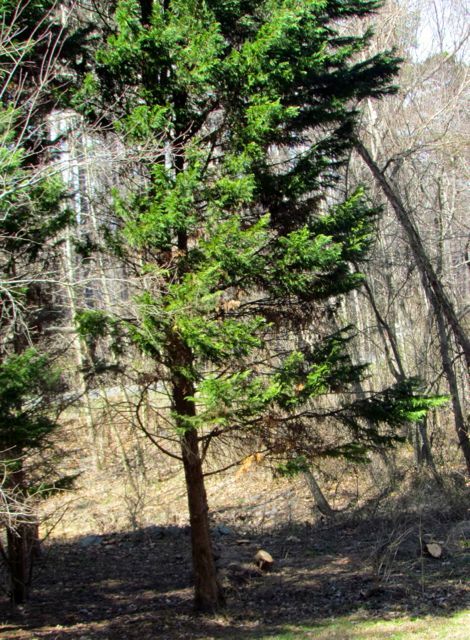 My Red Cedar choices were between a variety noted for its narrow growth form and one with a pendulous form. I have a few of these more pendulous trees already growing on my property. Their branches droop down aesthetically, but don’t seem to break from ice and snow any more than the straighter forms in my yard. We purchased three Juniperus virginiana ‘Hancock Weeping’ trees. The term “weeping,” in my opinion, is a bit misleading. The branches don’t cascade downward in the way that weeping willows or weeping cherries do. To my eye, such Red Cedars have broader shoulders that hang down a bit. Thus, the trees are wider. Hancock Weeping is predicted to reach a mature size of 25-30-feet tall and 8-10-feet wide — large enough to shelter us from the road, but not so tall as to be prone to toppling by bad weather. Newly planted Hancock Weeping with Leyland stump behind it. 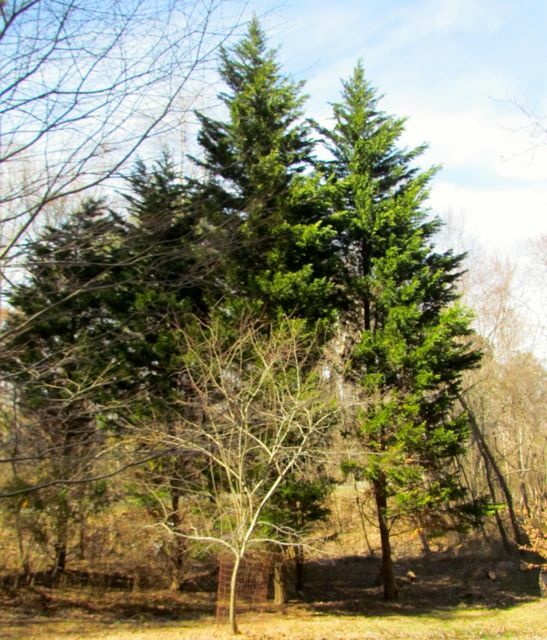 We arranged the new Red Cedars in a triangle near the creek. In front of those and facing our house, we added the two new American Hollies. As the hollies grow and produce berries, they should be framed nicely by a background of growing Red Cedars. In my mind’s eye, I can see them in their mature forms, valiantly blocking road sights and sounds, and feeding and sheltering wildlife. That ability to envision the futures of our plant charges is an important skill of successful gardeners. I wasn’t born with it. I developed it over the years — years of learning from my mistakes — mistakes such as planting Leyland Cypresses. I offer my experiences here in the hopes that I can save at least a few folks out there from repeating my mistakes. This entry was posted on March 19, 2015, 8:43 am and is filed under Favorite Plants, Native Wildlife, piedmont gardening. You can follow any responses to this entry through RSS 2.0. You can skip to the end and leave a response. Pinging is currently not allowed. Thanks for the reminder that Leylands are not wonder trees! So many people set them out w no thought of their eventual size, esp in subdivisions. I’ve also used native american holly and red cedar, plus white pine and southern magnolia ‘Kay Parris’ for screening, that work well if there is enough space for these big trees. All but the cedars do well in shade. Welcome, Mary! Yup, Leylands are definitely not wonder trees. I wouldn’t use White Pine where I live; I’ve seen too many struggle in my area. White Pines are native to cool, moist environments, and that just doesn’t describe the southeastern piedmont region in the summertime. As for Southern Magnolia, I agree it can be a useful screening tree. 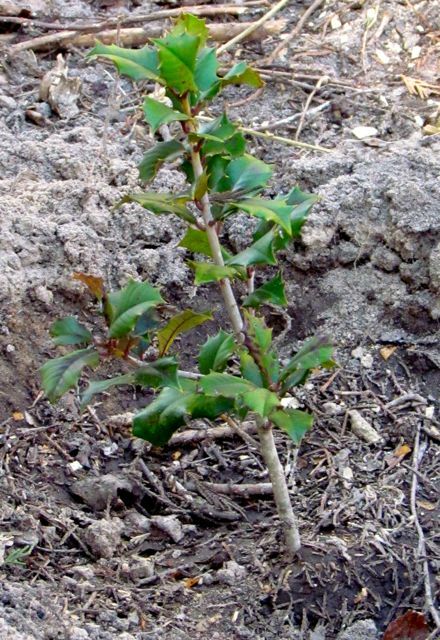 However, it has become clear in the last few years that this species is becoming aggressive in our floodplain/riverine habitats, outcompeting the natives in the manner of Chinese Privet. Technically, Southern Magnolias are not native to the southeastern piedmont region, and their evergreen, seed-spreading habits give them an edge against native piedmont plants. I have not had the heart to cut down the massive Southern Magnolia that was growing on my property when I moved in. But I frequently hunt for and remove seedling trees “planted” by birds. Those seedlings are especially aggressive in the moister parts of my yard near my creek. For a mixed evergreen border where you can vary heights a bit, I like to use our native Wax Myrtles. The Florida Anise Tree also works well in moister areas; it tolerates shade well.